Sofa seats a maximum of 2 people. One person in the group must be over the age of 18. Minors are not allowed up on the balcony area unsupervised. Can tickets be bought in advance? Tickets can be booked online, over the phone, or in person. Advance bookings are non-refundable or transferable except in exceptional circumstances and at the Cinema Manager's discretion. There is a 60p booking fee per ticket for phone or internet bookings. What time do I need to be there for the film? The doors open approximately 15 minutes before the advertised show time. We advise arriving before the advertised show time. Screen 1 is fully accessible for wheelchairs and allows access to the toilets and box office areas. Screen 2 is unfortunately not wheelchair accessible. To find out which screen a film is showing in just click on the time and day of the performance you are interested in. Charges apply but these are refunded for cinema customers. Please read the full text to understand how to claim your parking back. It is unfortunate that we have to charge but alas when it was completely free for everyone the car park would be full all day and our customers had nowhere to park. The car park is located off the one way street Hall Court Lane. If you were to stand on Walsall Road opposite the cinema and look left the road runs up the side between the dog groomers and St Marys Social Club. The car park is half way up the road and is covered in gravel. It is pay and display before 6pm with charges of 70p for 1 hour, £1.40 for 2 hours, £2.10 for 3 hours and a full day for £3.50. After 6pm or on Sundays there is no charge and no need to buy a ticket. The pay and display machine will print 2 tickets, the first goes in your car and the second which follows a few seconds later (so please wait for it) is a refund voucher you bring into the cinema to get your refund. If you decide to pay by app or by phone unfortunately we cannot offer a refund at this time. On entering the cinema please present the refund voucher when you place your ticket/refreshment order. We will refund the cost of your parking charge (up to a maximum of £2.10) off your bill. If you have booked tickets in advance either online or over the phone the refund voucher can be used against refreshments. The refund voucher has no cash value and cannot be exchanged directly for cash. We cannot refund parking for any other car park for example the council car park on Hunter Road. Do carer’s accompanying a disabled customer receive a free ticket? Yes, but we ask that you apply for and hold a valid Cinema Exhibitors Association card. We will not normally accept any other form of carer identification. You can apply for a CEA card by visiting ceacard.co.uk. 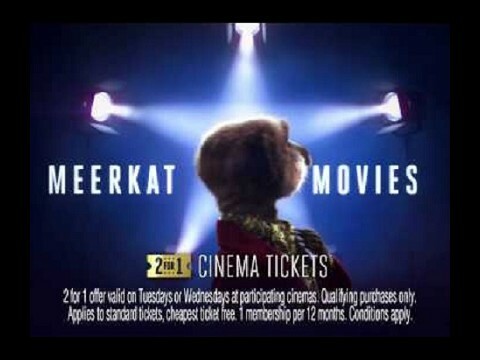 Do you accept Meerkat Movies vouchers? Yes we do! Just bring along the code to the box office with you. They can only be used in person, not for online or phone bookings. No, all films are shown in the standard 2D format here. Although we do not recommend bringing babies or children under 3 to the cinema, we do allow babes-in-arms to be brought in to screenings free of charge on the condition that if they start to cry or cause a disturbance of any kind they must be taken out of the auditorium immediately so as not to disturb other customers. We ask that babies and very young children are not brought to evening film performances. All children 2 or over must have a standard child ticket purchased for them. Will you be showing "The new ----- film?" We try to show as wide a variety of films as possible, however only having two screens means we cannot show absolutely everything that we would like to. We show a mixture of films on their release dates and a week or so after, so just because we haven't had something on release doesn't mean it definitely won't be showing at all. If there's a particular film you're interested in then don't hesitate to ring up and ask or fill out our contact form and we'll try to give you an idea of how likely we will be to show it. Why is my film not playing? I saw your showtimes on Google! The ONLY place to find accurate showtimes updated by us is on this website. We do not provide our showtimes to Google and as a result they may be incorrect so always check here or come to the cinema first. Online booking closes 1 hour before the scheduled performance. Screens are subject to change at late notice. Cinema weeks run from Friday to Thursday, with the films and times for the next week being added on a Monday evening or a Tuesday. Please check dates before making a booking. When making a booking you are booking a ticket to see the film, not a specific seat. Except on the balcony sofas where seating is allocated. Management reserves the right to refuse entry to anyone at any point. It is your responsibility to check your tickets and consider the suitability of the film you have chosen to watch, as we are under no obligation to rectify mistakes after a contract has been formed. Please note that tickets cannot be exchanged or refunded. The cancellation rights contained in the Consumer Contracts Regulations 2013 do not apply to the sale of cinema tickets. The unauthorised use of photographic and recording equipment in our cinema is strictly prohibited. We accept no responsibility for any personal property that is brought into the cinema. We reserve the right to ask any guest who is lucky enough to look young for photographic identification to prove their age for 15 and 18 rated films. The use of mobile phones in our auditoriums is strictly prohibited. If you are caught using your mobile phone in one of our auditoriums then you’ll be asked to leave. This is a piracy concern and also shows a complete lack of respect to your fellow cinema-goers. Children must remain seated for the duration of the featured performance, with exception only to restroom or refreshment breaks. Please understand that the cinema is not a playground, and that anyone roaming the auditoriums during the feature severely ruins with other guests viewing experience. Making noise, disrupting a performance or partaking in any other form of anti-social behaviour in the cinema will also result in you being asked to leave. In most cases you will also be asked not to return. Smoking and/or the use of electronic cigarettes devices is strictly prohibited through-out all of the cinemas auditorium and foyer areas. No dogs or any other animal is allowed in the cinema, the only exception to this rule is for Guide and Assistance Dogs.